Love that cat shadow. Cats always look so regal, don't they? Very nice. The shadow adds so much to the mood. look at those eyes! i love the shadows on this. aww what a pretty cat! i love here eyes, she is very wise! so cute! 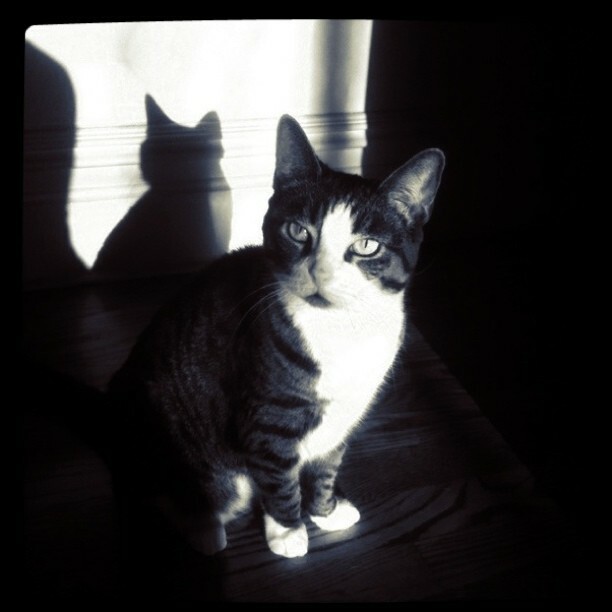 and the shadow is very cool..
What a pretty kitty...and with a nice shadow, too! Pets for the pets please...and maybe a little smooch. Love those paws...like she's in second position ;) Such a cutie in her little noir setting. What a sweet kitty. Love the softness of this photo. There's just enough light in this photo to enhance the shadows. How high would they go? How long would they cry? To climb to the sky? And say, “Get this, folks!”? so sweet. love the shadow! that look on her face ...like are you done yet? Cute! I love that even her shadow looks inquisitive. Great bold graphic design that you've captured here! And that face - looks like "hurry up Mom!" That expression is killing me!